What better to celebrate February 14 with music like this one! 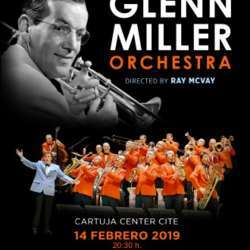 The Glenn Miller Orchestra offers us a spectacular concert that will transport you to the era of the great orchestras of the 40s with the help of Ray McVay, leader and eternal passionate of Miller's music. His music overcomes the passage of time acting pleasantly and melodically over the years, proof of this with Moonlight Serenade, the most recognized theme of the Orchestra.